It is April 1997, a Monday. A young mother gives birth to a girl in Cape Town's Groote Schuur Hospital. On the Wednesday, 48 hours later, the mother's life is turned upside down when it is discovered that her baby has been stolen. Then, 17 years later, the girl is reunited with her biological family in the most unlikely manner imaginable after she was discovered at school by her younger sister - a split image of herself. 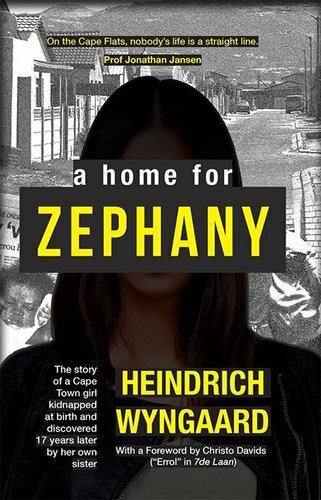 This book tells the tale of what is called "an extraordinary story of hope and serendipity" by M-Net's award-winning Carte Blanche programme. It is a story that touched newspaper readers, website visitors, radio listeners and television viewers across the globe: "Such an amazing story," commented Oprah's best friend, Gail King, the co-anchor of This Morning on CBS in America. A Home For Zephany records the tale, as it played out until now, through the voices of the girl's biological parents, Morne and Celeste Nurse, extended family members, neighbours, newspaper archives, Facebook posts, letter and SMS writers, radio and television presenters, politicians, clinical psychologists and journalists.